It has been suggested that Woodhead, Hamilton, Scotland be merged into this article. (Discuss) Proposed since June 2018. Hamilton is a town in South Lanarkshire, in the central Lowlands of Scotland. It serves as the main administrative centre of the South Lanarkshire council area. It sits 12 miles (19 km) south-east of Glasgow, 35 miles (56 km) south-west of Edinburgh and 74 miles (120 km) north of Carlisle. It is situated on the south bank of the River Clyde at its confluence with the Avon Water. Hamilton is the county town of the historic county of Lanarkshire. The town of Hamilton was originally known as Cadzow or Cadyou (Middle Scots: Cadȝow), the "ȝ" being the letter yogh), pronounced /kadyu/. During the Wars of Scottish Independence the Hamilton family initially supported the English and Walter fitz Gilbert (the head of the Hamilton family) was governor of Bothwell Castle on behalf of the English. However, he later changed loyalty to Robert the Bruce, following the Battle of Bannockburn, and ceded Bothwell to him. For this act, he was rewarded with a portion of land which had been forfeited by the Comyns at Dalserf and later the Barony and lands of Cadzow, which in time would become the town of Hamilton. Cadzow was renamed Hamilton in the time of James, Lord Hamilton, who was married to Princess Mary, the daughter of King James II. The Hamilton family themselves most likely took their name from the lands of Humbleton or Homildon in Northumberland, or perhaps from a place near Leicester. The Hamiltons constructed many landmark buildings in the area including the Hamilton Mausoleum in Strathclyde Park, which has the longest echo of any building in the world. The Hamilton family are major land-owners in the area to this day. Hamilton Palace was the seat of the Dukes of Hamilton until the early-twentieth century. Other historic buildings in the area include Hamilton Old Parish Church, a Georgian era building completed in 1734 and the only church to have been built by William Adam. The graveyard of the old parish church contains some Covenanter remains. The former Edwardian Town Hall now houses the library and concert hall. The Townhouse complex underwent a sympathetic modernization in 2002 and opened to the public in summer 2004. The ruins of Cadzow Castle also lie in Chatelherault Country Park, 2 miles (3 km) from the town centre. Hamilton Palace was the largest non-royal residence in the Western world, located in the north-east of the town. A former seat of the Dukes of Hamilton, it was built in 1695, subsequently much enlarged, and demolished in 1921 due to ground subsidence. It is widely acknowledged as having been one of the grandest houses in Scotland, was visited and admired by Queen Victoria, and was written about by Daniel Defoe. Hamilton Barracks was formerly the Depot of the Cameronians (Scottish Rifles) and the home of the 1st Battalion of the Regiment. The Regimental Museum is part of the Low Parks Museum. The Low Parks Museum is housed in what was a 16th-century inn and a staging post for journeys between Glasgow and Edinburgh. Recently refurbished, it is the oldest building in Hamilton and is to the north of the Palace Grounds. Renowned explorer and missionary Dr. David Livingstone's house still stands at 17 Burnbank Road and has a plaque about him. By road the town is to the west of the M74 motorway, the main southerly link to England, which joins the M6 just north of Carlisle. The main route from Edinburgh is the M8, leaving at junctions 6 or 7. Service industries and local government are major employers in Hamilton, as are Philips, the Dutch electronics conglomerate. The town centre has been regenerated with new indoor shopping centres (the Regent Shopping Centre, New Cross Shopping Centre) Hamilton Retail Park and the Palace Grounds Retail Park. Restaurants and national retail outlets are situated in a redeveloped part of the Palace Grounds that are visible upon entering the town from the M74 motorway. The creation of a circular Town Square has resulted in Hamilton receiving numerous town planning awards during the past decade. This development transformed the Hamilton side of Strathclyde Park, which was the original site of the Duke's palace. Hamilton has been a Fairtrade Town since 2005. Hamilton has three railway stations, Hamilton Central, Hamilton West and Chatelherault on the Argyle Line's Hamilton Circle. Hamilton Central is 22 minutes from Glasgow on the limited stop Larkhall-Dalmuir service. Beside Hamilton Central lies Hamilton bus station, providing links to surrounding towns and cities, also offering an express bus to Glasgow and also some parts of England. There are currently three comprehensive high schools in the town – Hamilton Grammar, Holy Cross and John Ogilvie. The former Earnock High School merged with Blantyre High School as the new Calderside Academy. There are also several primary schools in Hamilton, including, St Cuthbert's, Our Lady and St Anne's, St Elizabeth's St Peter's, St Paul's, St Mark's, St Ninian's, St Mary's, Glenlee, Townhill, Udston, Woodhead, Beckford, St John's, Woodside and Chatelherault Primary Schools. Hamilton also has one private school, Hamilton College, next to the Hamilton Park Racecourse. Hamilton is a university town with The University of the West of Scotland campus formerly sited on Almada Street, but now relocated to Hamilton International Technology Park in High Blantyre. Hamilton Academical Football Club (the Accies) was formed in 1874 and is one of Scotland's oldest senior clubs. It takes its name from Hamilton Academy, now called Hamilton Grammar School, the oldest school in the town (founded 1588). It is the only professional football team in the UK to originate from a school team and they currently play in the Scottish Premiership. Accies stadium is New Douglas Park, built in 2001 near the site of their former ground Douglas Park (which was demolished in 1994 to make way for a retail park). The Hamilton Rugby Club can be found at the Laigh Bent sports ground, Bent Road. They currently play in the Scottish Premiership Division 2. Hamilton Park Racecourse is situated alongside Bothwell Road. Hamilton Harriers are a local Road Running Club, they currently meet outside the Sports Club in near by town of Uddingston during the week and at the weekend at Strathclyde Country Park. There are a number of high quality football, rugby, cricket and bowling areas in the Hamilton Palace Sports Ground[permanent dead link] alongside the Mausoleum. Strathclyde Park provides access to world class water-sport facilities and Strathclyde Park Golf Course[permanent dead link]. Hamilton Golf Club is situated across the Avon Water in nearby Ferniegair. The Hamilton Lawn Tennis Club provide the town with a set of four floodlit artificial grass tennis courts based at Blackswell Lane. The town is also now home to a Virgin Active Health Club, which hosted the tennis at the 2011 International Children's Games. In recent years the Virgin Active men's tennis team have won the Men's Scottish cup twice (2011, 2012) becoming the first team attached to a commercial chain health club to win the trophy in its history. Speedway racing was staged in Hamilton at the annual Lanarkshire Show from 1947–1955 on the old ash football pitches of Strathclyde Park (now covered by the town square). Hamilton Townhouse Theatre is a 500-seat venue in the Cadzow Street area of the town. It is the first cultural venue in Scotland to attain the prestigious Quest accreditation. A multiplex Vue Cinema is located in the redeveloped Palace Grounds area close to the Hamilton Palace nightclub. Hamilton is twinned with Châtellerault in France. This connection dates from the 16th century when the title Duc de Châtellerault was conferred on James Hamilton, 2nd Earl of Arran. 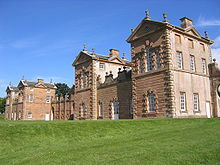 The Duke's hunting lodge (now in Chatelherault Country Park), a primary school and new railway station are named 'Chatelherault' for this reason. ^ "Hamilton (South Lanarkshire, Scotland, United Kingdom) - Population Statistics, Charts, Map, Location, Weather and Web Information". www.citypopulation.de. Retrieved 12 April 2019. ^ "Scotland's Census Results Online". Scrol.gov.uk. Retrieved 3 May 2009. ^ George Chalmers, Caledonia, Or, A Historical and Topographical Account of North Britain from the Most Ancient to the Present Times: With a Dictionary of Places, Chorographical and Philological, Vol. 6 (A. Gardner, 1890), p. 683. ^ "SILVERTONHILL". Historic Hamilton. 30 September 2015. Retrieved 1 August 2018. ^ "Hamilton, Chatelherault, Larkhall links | Sustrans". Sustransconnect2.org.uk. Retrieved 14 November 2012. ^ "BBC - A Sporting Nation - Jock Stein dies 1985". ^ "Davie Cooper | Scotzine". ^ "Earnock Miners' Path". Heritage Paths. Retrieved 1 August 2018. 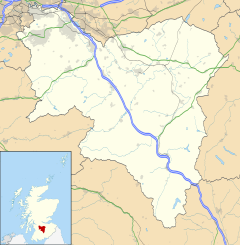 Wikimedia Commons has media related to Hamilton, South Lanarkshire. This page was last edited on 12 April 2019, at 21:14 (UTC).